Even though I love my smile, I’m always sipping drinks that have the potential my teeth. I can’t ever give up Diet Coke or coffee, and I’m not mad about it — but because I love my not-so-healthy drinks, I’ve thought about teeth whitening for a while. I’m so excited to partner with Smile Brilliant for today’s post! Read on to learn more about my thoughts and to enter a giveaway! When I first heard about at-home whitening, I was curious and a little cautious. I’ve heard so many horror stories about permanent teeth sensitivity and stains after at-home whitening, and I wondered whether it’d be risky to do it myself. After talking to the Smile Brilliant team, I decided to give it a go. I wanted to share the process from start to finish to give y’all a chance to consider using it yourself! First, you get a package in the mail with a ton of stuff in it. I was overwhelmed when I opened the box, but it’s actually straightforward! 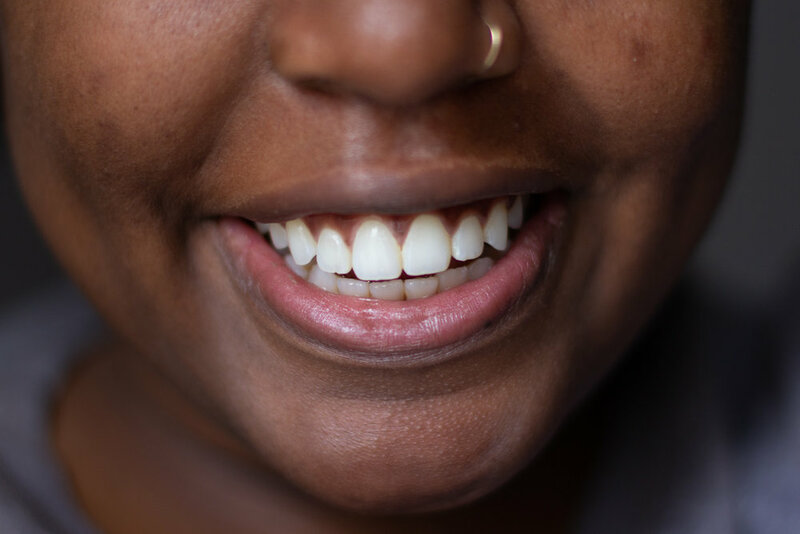 The first step in the teeth whitening process is getting your impressions back to Smile Brilliant’s office so that you can get custom-fitted trays to try out the whitening gel. To take the impressions, you only need to follow the instructions inside the package! You mix together the putty they send and bite down hard, and you’re left with a realistic model of your teeth. I totally messed it up the first time, but I was able to fix it because they send extra. Once you’re done with that, you send it back to their lab with the prepaid label in your whitening kit. 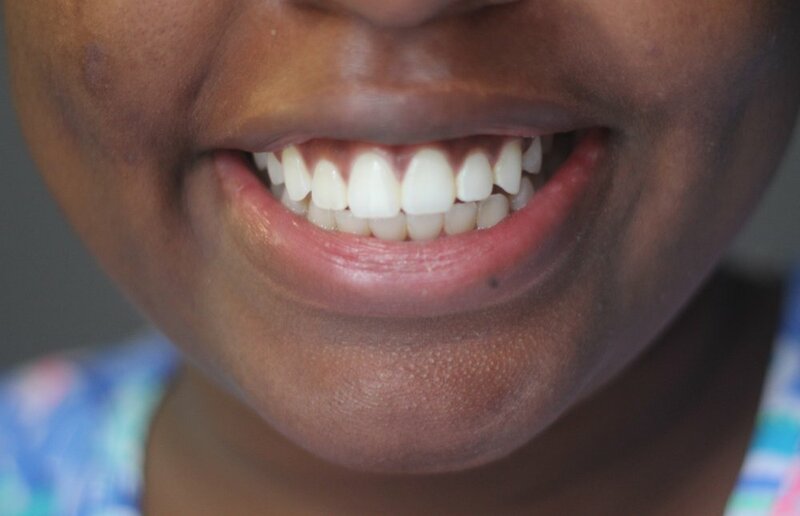 After the impressions are sent away, Smile Brilliant’s dental lab creates whitening trays based on your impressions. Picture gloves but for your teeth — that’s basically what happens. It’s important to be careful while taking the impressions or else your trays may not turn out the way they should. Once the trays are made, they mail them to you! It takes some work to get to this point, but once you’re here, the fun begins! You’ll receive several packages of both whitening gel and desensitizing gel to fill the custom trays with. Wait until nighttime but before you’ve brushed your teeth and add some whitening gel to the trays. (It’s recommended to use about 1/3 of the provided syringe, but I used closer to 1/4). Leave it on for a while — Smile Brilliant says an hour to 3 hours will give you the most effective results. I never lasted three hours, but I regularly had the trays in for longer than an hour just because it’s so easy to go about life as normal with them there. I would’ve been able to go three hours if I remembered to put the trays in earlier, but I was usually ready for bed after an hour or so! When whitening is up, it’s time to desensitize! Brush your teeth like you normally would, and rinse out the whitening trays as well. Add some desensitizing gel to the trays and pop them back in. This is such an important step. I never whitened without using the desensitizing gel, and I experienced no sensitivity as a result! After 15-30 minutes, you can spit out the excess in the sink, but you shouldn’t rinse to allow the gel to work its magic. Go to bed with the desensitizing gel still on your pearly whites, and you’ll wake up feeling great! My teeth weren’t super yellow beforehand, so I wasn’t expecting a dramatic change, but I was super impressed at the transformation I saw! My smile is much whiter than it was beforehand. (These were taken at the same time of day in front of the same window.) Again, they aren’t perfect, and I still have plaque issues thanks to my flossing habits (TMI) but Smile Brilliant gave me a beautiful smile! 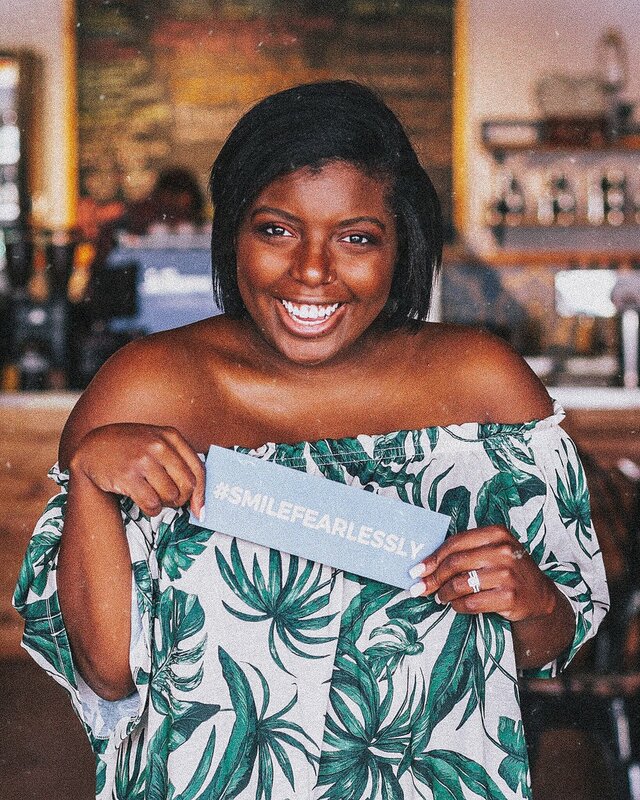 Ayana Lage is a fashion and lifestyle blogger based in Tampa, Florida with a background in digital media and content marketing. She’s worked for Bustle, the Tampa Bay Times, the Miami Herald, and numerous freelance clients. As a blogger, she’s worked with 50+ lifestyle, fashion, travel and food brands. When she’s not blogging, she’s focused on her day job in digital marketing, watching Queer Eye, or laughing aloud at tweets from @dril. Hi, friend! (I call everyone friend, including strangers.) My name is Ayana Gabrielle, and I love finding great deals, making new friends and eating yummy food! I studied journalism at the University of Florida (Go Gators!) and work as a digital content writer. My blog is primarily focused on fashion, lifestyle, and being married to my sweet husband. Thanks for stopping by — I hope you stay a while.